We’ve all done it: written finger numbers above notes when a student continually trips over a challenging measure of music. The “fix” is almost instantaneous. Dutifully following our pencil markings, our student wiggles the correct fingers at the right time and the problem seems to disappear. But in reality the problem hasn’t disappeared at all; it’s simply been buried. The root of the problem remains, and, like a pesky weed, it will return. And when it does return, it will be a slightly bigger problem. This bigger problem will continue to grow as we continue to feed it finger numbers. So what should we do with those measures that stop our students in their tracks? How else can we assist them in sorting out their issue and moving on with their piece? Today we’re sharing five “pencil-free” teaching tools that you can use to sort out challenging measures in a way that solves the underlying issue and prevents it from reappearing over and over again. While writing in finger numbers and note names can be helpful in limited circumstances, relying on them to fix note reading issues creates, what I call, the “color by number” problem (where a piano player can make beautiful music while still lacking the skills to independently perform equally-challenging music just as someone using a color-by-number painting kit can lack the skills to create an equally-beautiful painting). To avoid this, here are 5 ways to teach students to tackle difficult measures while also helping them build skills that can be called upon when playing challenging music in the future. 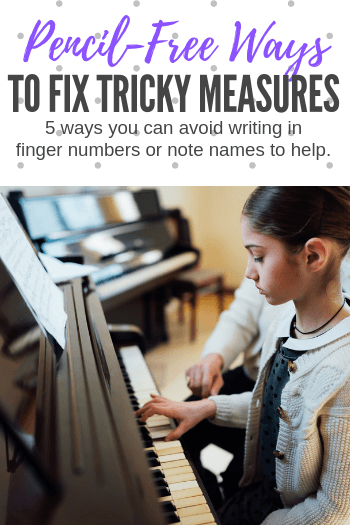 In many instances, a measure that is “tricky” for students is actually a measure that contains notes that they are not yet comfortable reading. To help with this issue, isolate the difficult measure, verbally identify the notes and then classify these notes into a note set. For example, if the challenging measure contains D-F-G-F-D, you would have your student verbally name the notes and then ask them, “What notes lie under your fingers that are NOT part of this note set?” (Answer: C and E). Your students can then think of this measure as, “The measure where there is no C or E” OR “The measure where I only use D, F, and G”. This strategy of elimination and sorting is a powerful brain tool that really works. Using teaching cues that include intervallic associations, is another strategy to add to your students’ Tricky Measure Toolbox. When exploring a challenging measure of music, ask your students questions such as, “Are the notes moving all in one direction?”, “Do you see a pattern of steps and skips?”, “How many repeated notes are in this measure and what direction do the notes move in the next?” By having kids respond verbally you are creating learning landmarks that can be relied on during home practice. When challenging measures of music emerge, a teacher’s automatic first assumption is that it is a note reading issue; which is often the case. Sometimes, however, the issue involves the connection between the brain and the fingers. To engage muscle memory and solve this issue, move away from the piano and try “tap practice” (read more about that here) to undo any reinforced habits that may be causing the problem. Tap practice will also help students engage in the “elimination and classification” strategy, as they learn to recognize the fingers that are not being used, the fingers that ARE being used and the patterns that begin to emerge. Verbalization is a valuable teaching tool that can be used to fix the troubles in tricky measures. To use this strategy, try singing the note names with the corresponding pitches instead of simply naming the notes. This will help your students combine several of the aforementioned strategies at once, including absorbing directional movement, eliminating and classifying notes into sets, and identifying landmark notes. Go A Step Further With A Method Book That Does It All! Teach Piano Today’s WunderKeys Primer and Level 1 method books are designed to give students the strategies they need to decode their music without needing any “pencil-added” assistance. Stop note-reading issues in their tracks with method books that set your students up for long-term success while eliminating those common frustrations beginning piano students often face. Find out more at www.wunderkeys.com.